As we launch into the 2018 summer season of punishing tariffs and counter-tariffs and with the present bad feelings between the global powerhouses, perhaps a second look at what we are *actually* trying to accomplish is in order — and if a better way of accomplishing our goals appears — would today’s leaders be bold enough to employ such a change-up? Taking the American position as an example; U.S. President Trump feels that American steel and aluminum are at a competitive disadvantage to countries like, well, every other country in the world, which is why he has instituted import tariffs of 25% on steel and 10% on aluminum. Different tariffs have been levied by Trump on other imported items. All of which is supposed to help American steel and aluminum companies compete in the international marketplace and overcome decades of less-than-stellar reinvestment in U.S. rust belt industries such as steel and aluminum mining and smelting. The pushback from exporting countries has been considerable and is expected to be matched on a dollar-for-dollar basis. Trade war, much? The First Rule in Every Crisis: Don’t Make it Worse! While there is plenty of angst to go around, President Trump must remember that the entire situation was created by every U.S. president since President Carter, and that countries were never told to stop or slow the exports to the United States, nor told to lower their exports to other Western nations. That means it’s time for President Trump to ‘play nice’ with exporting countries — which have done nothing more than play by the rules that America itself had set. The problems of the $862.2 billion balance of trade deficit that America is trying to draw-down can be made worse via bad communications, additional tariffs, or clumsy handling of the situation. Let’s not do that. Rather, let’s try to improve on trade deficit elimination as time rolls forward. Apart from not making it worse, the present uncomfortable situation could be solved to every party’s satisfaction by designing a tariff regime to solve the fundamental problem instead of trying to address each good or service individually — creating a pathway, not only to solve immediate concerns — but to provide additional revenue to assist the above-noted and other American industries stung by poor vision, poor leadership, and poor management of U.S. trade policy from the 1980’s onward. Instead of piecemeal (and high) tariffs that are seen as exorbitant in some quarters, President Trump should institute a standardized 5% across-the-board tariff on every single good imported into the United States. The gross total revenue of that 5% tariff would far exceed the revenue that would be collected by the present bric-a-brac collection of deeply unpopular tariffs. With an annual tariff revenue pool that would far exceed that of the present tariff regime, the United States could allocate generous and proactive funding to several of America’s poorly-performing economic segments, which spending would be completely at the discretion of the Trump Administration and its successors. That’s an extra $120 billion (approx) for America annually. And then, pour yourself a nice cool drink Mr. President because you’ve won. End of the trade war, the beginning of accumulating billions of dollars that can be directed to American industries that have suffered as a result of heretofore unrestricted imports from economies that benefit from low-cost labour and lower environmental standards. Nothing would put a salve on the present air of hurt feelings like a major signing ceremony between the U.S. and China where both countries see it’s in their best interests to drop the existing punitive tariffs and support and abide by a standardized 5% tariff regime. No doubt that the EU, The Commonwealth of Nations, Russia, and other global exporters would enthusiastically sign a matching and standardized 5% tariff agreement with the Trump Administration. Problem solved. And everyone makes more money! That’s how to employ the ‘Art of the Deal’ to turn a negative into a positive. Maybe it’s time for a superpower group of the US, China, the EU, Russia, and The Commonwealth of Nations to form up, instead of the G7 group that has worked very well until now. It’s unfair to the US, it’s unfair to the smaller or weaker members of the G7 club and it’s unfair — even to near-superpowers like Japan and Germany which have far different challenges and causes to ‘plow’ than those of the superpowers. 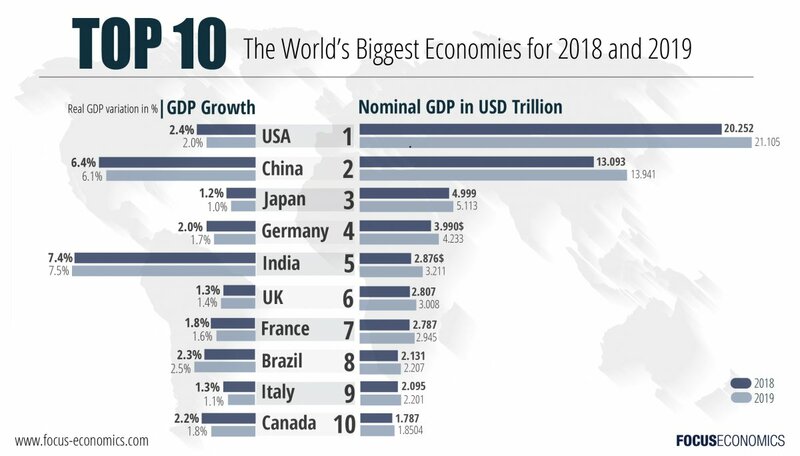 If we’re talking GDP, the US represents 52.8% of the Group of Seven’s GDP, while the next largest country in the group (Japan) represents 13.3% of GDP, with only Germany at 10% remaining as the only other double-digit GDP member of the G7. Should the US Join It’s Own 1-Member Club? That may be a tempting thought for President Donald Trump and certain members of his administration, but there are common concerns among superpowers that only apply to superpowers (and there’s no doubt the US remains the Number One superpower by a significant margin) and it’s those superpowers that must work together to deliver solutions for their large populations. 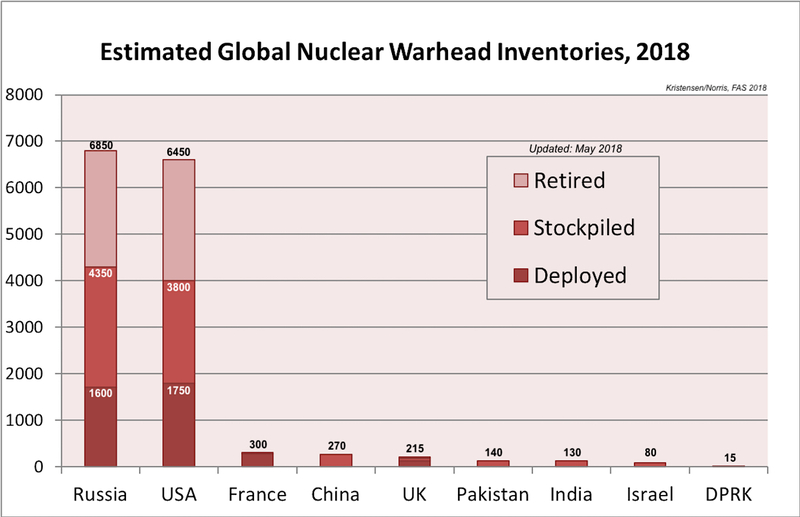 Although nuclear stockpiles vary, the US and Russia were the main protagonists of the Cold War which lasted from 1950 through 1990 which is why they own far more nuclear weapons than all other countries combined. The only EU country to publish their ownership of nuclear weapons is France, with 300 warheads. The Commonwealth of Nations countries that publish ownership of nuclear weapons include the UK, Pakistan and India. And, isn’t ‘that’ what it’s really all about? Read the next blog post: G7 – Please Save Our Seas! Posted on June 19, 2018 Author John BrianCategories G7, International Trade, U.S.A.Tags 2018 G7 Summit, China, Donald Trump, EU, Russia, The Commonwealth of Nations, U.S., United States, US2 Comments on Is the US ‘Too Big’ for the G7? But it’s not as shocking as some new ideas that have come to light, such as putting engines in sailing ships enabling them to easily cross entire oceans, or passenger travel by aircraft instead of train, or that man should walk on the Moon by 1970. Still, the idea that America’s Big Three automakers could stop building their cars in other countries might be seen as a novel idea. Chrysler, Ford, and GM have auto assembly plants in Canada, the United States and Mexico where they produce millions of cars and trucks per year. The majority of those vehicles are then sold into the U.S. because it’s a far bigger market than the Canadian and Mexican vehicle market combined. President Trump wants to lower the unemployment rate in his country and help make his domestic auto industry stronger and more responsive to the American market via high tariffs or restrictions on the number of cars Canada and Mexico could export to the United States. Five years on, let’s say that every Chrysler, Ford and GM car and truck sold in the United States is manufactured in the United States, unemployment is at an all-time low, and the American economy is rocketing along like it was in the 1960’s. Great! As the Big Three factories presently located in Canada would still remain, new licensee companies approved by Chrysler, Ford and GM could build all the Chrysler, Ford and GM vehicles required for the Canadian market and build 100% of them in Canada, while still keeping to U.S. auto company specifications and quality. Such licensee companies would be required to meet the same manufacturing standards and warranty terms. Or, entirely new companies could be formed; One company (‘Chryton Co.’) could build all Chrysler cars and trucks for the Canadian market by purchasing the existing Chrysler manufacturing plants in Canada and paying the required per-unit license fees to Fiat Chrysler USA, while Canadian-owned ‘FordX’ could build every Ford car and truck for its Canadian dealers after paying its per-unit license fee to Ford USA. Likewise, GM vehicles would be built by a Canadian-owned and GM-approved company (‘AC Delco’) that would pay a license fee to GM USA for each vehicle it builds for the Canadian market. If you live in Canada and you want a Ford car you’d simply order the car online and the Ford-approved Canadian company 3D prints and otherwise assembles your Ford car and the car arrives at your local dealership a few days later. You might even choose to watch it being 3D printed, painted, and assembled on your tablet or laptop computer. Yes, other than upholstery and tires, etc. all 3D printed cars and trucks will be made from aircraft grade aluminum alloy as aluminum works better than steel for 3D printing. Imagine if EVERY new car and truck sold in Canada is built in Canada by Canadian companies that pay a license fee to the respective American, European, or Japanese automaker. That equals full employment in the Canadian auto sector, without the (understandable) griping by President Trump about American job losses. NOTE: I understand that hand-built cars like Rolls Royce, Ferrari, Aston Martin, etc. would decline to take part in such an arrangement, but those cars account for less than 1% of the North American market share. They would simply continue to export their cars to their North American customers as usual. The era of ‘things-based’ globalization is morphing into ‘ideas-based’ globalization where things are designed in country ‘A’ by a company that retains 100% rights over who is allowed to 3D print and assemble its products in country ‘B’ — which could be literally anywhere on the planet. Whether it’s T-shirt graphics electronically transmitted and licensed to a company thousands of miles away (as is done now) or whether licensed companies 3D print and assemble your foreign car in the city where you live — globalization might finally become all that it can and should be — creating hundreds of thousands of jobs in each country for workers in 3D printing/manufacturing factories that could literally build anything, anytime, for anyone, as long as they have purchased the proper license. Such ‘On Demand’ manufacturing might become the biggest job creator ever and lower the tensions brought on by the endless competition between the world’s free trading nations. Ready for the future? Order your locally-manufactured foreign car here.